As a double major, one day you will eventually have to prioritize your majors one over the other. In talking with students with a double major, this is typically the case (though not always) with students having the second major supporting their primary major. For me personally, I would say this is especially true with degrees in Communication and Psychology. My main area of focus being Communication and my supporting major being Psychology. In today’s post, I want to highlight the wonders of the Department of Communication here at UMD and why it truly is a “diamond in the rough.” After having conversations with Department Head, Dr. David Gore, Associate Professor Dr. Ryan Goei, and Director of Internships for Communication, Alastair Knowles, I was able to gather an abundance of information from all three in highlighting the Communication department. With that being said, let’s begin! In order to understand the Communication department here at UMD, I find it important to understand the Communication discipline altogether. Generally, Communication programs will have a mixture or divide of the social sciences and humanities (also known as rhetoric in the Communication discipline). You can think of the two as different processes or approaches to communication. On one end, social scientists seek to observe the present, they prefer data, numbers, and statistics where findings can be generalize to the broader population and are concerned with what can be observed in reality. On the opposite end, rhetoricians seek to understand human nature versus predicting it, they prefer concepts related to philosophy, history, and context, and require one core element – the human experience. In expanding on this topic of social science and rhetoric, let’s explore the concept of fear appeals as an example. A social scientist might look into fear appeals and analyze the effectiveness of fear appeals on people and its ability to persuade. On the other hand, a rhetorician may look at fear appeals, and instead of analyzing the effectiveness, will analyze the ethics of using fear appeals overall. To end, I like to think of social science and rhetoric as an objective and subjective approach to understanding communication. Social science being the objective, while rhetoric being the subjective. 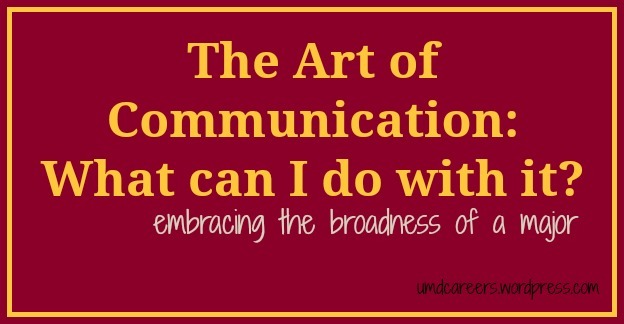 Now that we have a basic understanding of the communication discipline as a whole, let’s explore the elements of UMD’s Communication program. What makes UMD’s Program So Unique and Special? After explaining the two approaches to Communication, one can easily see how a divide or rift may quickly emerge within Communication programs. Fortunately, the professional environment here in the Communication department is one that is quite healthy and friendly where faculty members are open and respectful to one another’s approach to communication. The faculty here see the value in BOTH perspectives and therefore the program creates a flexibility of the mind. Additionally, as a generalist program that offers and requires courses in both approaches students in the program can pick whichever route they prefer. This is possible due to the program being an open-minded program and thus offering a variety of elective courses. For starters, UMD attracts some of the best Communication scholars across the nation (and I’m not just saying that out of my own bias, it’s true!). With current scholars contributing major research to their fields to individuals previously winning “Dissertation of the Year” awards to professors writing top papers on a national AND international scale, they are here at the UMD Communication Department. Here’s a list of the faculty recognition in the past decade. Despite being a satellite campus of the University of Minnesota, UMD is an extremely unique institution as a whole due to its high level of research productivity and its student population consisting mainly of undergraduate students. Commonly, a high performing research institution would consist of numerous graduate programs and a high percentage of graduate students conducting outstanding research. Here at UMD, we have 90% of our students who are at the undergraduate level, yet still conducting research just as valuable as other top-tier research institutions. So what happens if you’re not into academia, scholarship, or research? Well, lucky for you there are opportunities to find hands-on experience through the Communication Internship Program. Ultimately, the program has two objectives, (1) provide students with opportunities to apply what they’re learning in the classroom into the real world, and (2) provide students with opportunities to acquire internships related to a career occupation that they find interesting. In addition to the two, starting the Fall semester of this year, the Communication Internship Program will be implementing a new course in which it will better prepare students for the internship process. Before ending, if you would like to learn more or are having trouble finding a good place to start in terms of internships, you can always refer to the Communication Internship Program comprehensive web page, or better yet, set up an appointment to meet with Alastair Knowles. In closing, I would like to sum up by talking about my personal experiences and self-reflection. Coming into college as Undecided, I was the type of student who wanted to do everything and had a very hard time deciding a major. Eventually, I would stick to Communication after my first semester taking “Intercultural Communication” and since then have never regretted that decision. As I slowly progressed through the program, I was fortunate to take courses with different instructors and professors who I found to be extremely inspiring and brilliant. Their teaching philosophies, passion for research, and devotion for students motivated me to acquire a hunger to learn more about being an effective and efficient communicator in addition to being a charismatic leader. Throughout my time here at UMD I would say that many of my favorite professors are mostly, if not all, from the Communication department. As I mentioned in my recent blog posts, my experience as a first-generation student has been a significant factor to my college experience altogether. As a first-gen student, there were many moments of insecurity in terms of my academics and intellectual capabilities, but that changed every time I came around the COMM department. Essentially, the COMM department became my safe haven to learn and discuss freely about ideas, history, theories, and communication in practice. The conversations, guidance, and criticism from my professors were all key components to my intellectual and personal growth. In ending, I know I’m biased when I say that the Communication department here at UMD is perhaps the best program at UMD. But my main point for you, my readers and peers, is to find a program you can be excited about when entering your classes and be hungry to learn in whichever topic or topics interest you most. More than often do I see my peers or other students who come into college and zoom right through to get their degrees and start working right away, but if we just take the time to slow down, relax, and enjoy the time that we’re here the end result will be much more meaningful. Talk to your professors, explore related theories, criticize past research, or even conduct your own research. You never know what you’re truly capable of until you try, and it always helps to have a mentor guide you to your true potential. Organization, title, and a brief synopsis of what you do. I work for maurices as the HR Coordinator on the Human Resource Business Partner team. In this role, I am responsible for local networking and outreach which includes attending career fairs, coordinating job shadows and group visits, and conducting informational interviews. I am responsible for the start to finish recruiting for temps, interns, and entry-level positions, as well as the onboarding of new hires. I am also responsible for various compliance related tasks such as unemployment. My favorite part of my job is that I am always presented with new things to do and projects to work on – there is something new every day! Karissa recruiting for maurices at the Spring Head of the Lakes Job & Internship Fair. I originally went to UMD for Marketing, but after taking my HR Principles class I realized that HR was more in line with my interests. A later internship in HR solidified my decision to change majors. I grew up in the Twin Ports area and always wanted to work for maurices. About a month before graduation, I attended the UMD Alumni Networking Night determined to talk with a representative from maurices. Our discussion went well, and a few weeks after the event the Recruiter called me and told me about a temporary opportunity available at maurices in the Human Resources Department. I jumped at the opportunity and began working at maurices two weeks before I finished classes. Since accepting that temporary position, my job is no longer temporary and has continued to evolve. Something I wish I would have known, and taken advantage of, is being more involved while at school. There are so many opportunities available and clubs to join. I joined the Society of Human Resource Management (SHRM) my junior year and had so many great opportunities to learn from professionals in Duluth, I just wish I would have done it sooner! My advice would be to just put yourself out there. I know that it sounds cliché, but the best things really do happen when you step outside of your comfort zone. I would also add to say “yes” to every opportunity you are given – even if it is not exactly what you want to do. This will help you figure out what you like and don’t like. Plus, it will demonstrate your willingness to work hard, which will not go unnoticed! Take advantage of the amazing resources that are available to you, especially at Career & Internship Services, which offers resume and cover letter review, interview prep, and more! These resources are free and will help you be prepared and confident when applying for jobs. The sooner you start this, the better. Also, be sure to attend career fairs and networking events and be prepared and confident when approaching employers. Even if you are not looking for a position immediately, forming relationships with employers will be to your benefit when you begin your job search. I loved going to UMD and attending LSBE. It is a great school in a great community. I knew that I wanted to stay in Duluth and feel so lucky that I was able to do that. I think that going to school at UMD helped make that happen as I was able to form connections in the community. Through working in HR at maurices I have had several opportunities to return to campus for presentations and career fairs and I am always SO impressed by the caliber of students I talk with at UMD. Interested in maurices? Check out their Careers page. Essentia Health, Content Management Specialist. My job is a mix of content management, graphic design, web design, and communication management. I manage the HR related pages of the employee intranet as well as create documents, images, and videos relating to HR topics such as benefits, payroll, retirement, etc. I also develop internal resources to assist the HR department document their processes and streamline their work. During my undergraduate in interned in an HR office. That experience helped me be hired as a temp in Essentia’s HR office. Because of my temp role, I then was an excellent candidate for a role that opened up in their call center. While in the call center, I learned many aspects of the HR department, which in turn prepared me for my current role. GET INVOLVED! I attended numerous on-campus events and was part of multiple campus groups, some fun and some professional, but all involved getting to know new people and making connections. Networking is essential in a professional career. ASK QUESTIONS! When you are new in the field there are things you aren’t going to know, just like in a new class. Don’t be afraid to ask how something works or why it’s done that way. Most people are happy to share their knowledge with you! Communication is rapidly evolving – having knowledge of coding is becoming more and more essential to a designer’s toolkit. Having to wait for a coder to get back to you can severely delay progress, so if you can at least learn the basics, it will go a long way. My degree was in psychology, yet I work in more of a digital communications role that focuses on HR content. Your degree is important, but your experiences are equally important. Make sure you find experiences that match where you want to go in the future or create them within your job where possible. For example, my role in the HR Service Center at Essentia did not include creating job aid documents, but I wanted to create them for some of my processes, so I started creating them in my spare time. My supervisor noticed and liked them, so I made more. That experience directly aligned with my current role and made a huge impact during my interview because I had past work to show them. Interested in Essentia Health? Check out their employment page. I can recall back to my newbie days in the office and having my resume reviewed during Resume Drop-Ins. One time, in particular, was when I had my major listed as “Communications” and how I should remove the “s.” At that time, I thought to myself, “does it really matter?” Two years later, as a veteran peer educator and senior in my COMM major I have come to realize, “YES! It does matter, it matters A LOT actually.” It’s crazy how one single letter can change the entire meaning and context of one word. If you have read this far, I’m assuming I have caught your attention? If so, read on! If not, read on! To start off with the basics, the word “communication” differentiates from “communications” in terms of the channels that we actually send and receive messages. One of the many ways that communication is defined is “the means of connection between people or places, in particular,” (Source, definition #2) On the other hand, communications is defined as “the means of sending messages, orders, etc., including telephone, telegraph, radio, and television,” (Source, definition #6). Can you tell how the two are different? Why is this an issue? Well, when students say that their major is Communications, some folks will imply that they are studying media, journalism, technology, but in reality they mean to say that they are studying Communication: human interaction, rhetoric, communication methods and inquiries. Now that we have defined and differentiated the two let’s move on to the final piece of the puzzle, the denouement (final result, outcome, you get the picture). Now that we know the definition and difference between the two, let’s conclude and attempt to find a moral of the blog post here. You see, I didn’t write this blog post just because it grinds my gears every single time when students say their major is “Communications,” nooo, why would I do that? (Insert sarcastic remark here.) On a serious note, I think it is crucial that we know the difference between the two words to maintain some sense of credibility and understand how it affects us. When conversing with professors or professionals, it’s nice to have some sense of credibility in what we say, therefore, by knowing the difference between the two terms it can hopefully bolster our credibility. It’s a blessing and a curse to know the difference between the two terms, and in the long run, it is most beneficial to understand how these two differ to better perceive the field of communication/communications. Before closing, I would like to share how this has affected me in my professional career. As an undergraduate student aspiring to go to graduate school, I have seen significant changes depending on what I type in the search bar. By typing in “masters programs in communications,” the programs that appear in the Google search are all related to technology, media, and journalism. On the other hand, I find my intended results when typing in “masters programs in communication.” When looking for graduate programs in the field of Communication, I think it’s critical students know the difference between the two terms to better filter graduate programs. On a closing note, the realm of communication is one that occurs in all life forms. Whether a teenager is contacting their crush the first time, a lost whale calf calling out to its mother, or even a spirit trying to get its buddies to scare the crap out of people, the art of communication is all around us. Stick around for future posts as I will be writing more about the realm of communication. Enjoy the weather and as always, stay gold my friends! The Art of Communication: What Can I do With It? Editor’s note: Since the Communication major is so broad, we are highlighting your options with the major in multiple posts. Take a look at What can I do with a Communication Major for information on working in Higher Education, Law, and Non-Profits. “The act or process of using words, sounds, signs, or behaviors to express or exchange information or to express your ideas, thoughts, or feelings to someone else.” What does this actually mean? Well, according to Merriam-Webster Dictionary this is the definition of Communication. We live in a world where we spend every second of our lives communicating. The topic of communication is so broad that I could go on and on talking about the topic. The same goes for the area of study as well. Communication studies is a very, VERY broad area of study and is growing at a very rapid rate. In today’s blog post, I’ll be talking about the wonderful topic of Communication, whether you’re a Comm major, minor, or just a daily reader I hope this insight helps you in your studies and daily activities. What can I do with a study emphasis in Communication? The common question that most people typically have is, “What can I do with a Communication degree?” Well my friends, there is no definite answer to that because the field of Communication is just so broad! As Whitney had mentioned in her last blog post, some possible areas that you could go into with a Communication degree are higher education, non-profit organizations, or law. With those areas being the common fields that most scholars go into, there are still many, many more fields out there as well. Some of these fields may consist of business, marketing, government and social services, broadcasting and journalism, healthcare, human resources, and the list goes on and on and on. At the end of the day there is no definite route for a Communication graduate nor is there a definite route for a Chemical Engineer, Historian, or Graphic Designer. What I’m trying to say is that a certain degree doesn’t and shouldn’t define your entire life path, it’s just a good place to start. Now if you know where you would like to specialize with your Comm degree then that’s great! Your minor and having an internship or specific job in a communication area are great ways to do some of that specializing. Having a game plan and alternative options is always a nice way to secure your future, but if you are anything like me, then you shouldn’t be scared of the future. When I say “anything like me” I’m talking about those who like to “go with the flow” or just being open to anything and everything. Though I typically try to plan for my future, I favor the idea of being open to new opportunities and experiences. I still don’t know what I want to do after college with my Comm degree yet, but with the experiences that I currently have I feel confident that I’ll end up in a career that I feel highly passionate about. In the end, your experiences will be the key to you finding your dream job. Our experiences are what shape us to be who we are and who we want to be and with an endless amount of possibilities in the real world it really is a great day to be a Communication scholar. What are recent UMD Communication graduates doing? The field of communication is so broad that some people may shy away from it because there is no set career pathway. Others love the endless possibilities of this major offers. Either way, it is nice to have an idea of what types of career pathways you can choose from when you decide to pursue a degree in communication. Especially since the field of communication is growing rapidly. Some of the different areas that I will talk about in this post that you could potentially work in with a degree in communication are: higher education, law, or non-profit organizations. There are several positions in higher education such as teaching and research that are quite obvious you can do with a degree in communication, and there are other positions that are a little less obvious such as student support services. There are many great positions in offices such as admissions, financial aid, and student affairs that look for people with a strong communication background. A great way to prepare for a position in higher education are to get involved around campus whether it is in the residence halls, student organizations, or orientation programs. There are many leadership and organizational gained through positions like these and it will reflect strongly on your resume no matter which profession you end up choosing. In higher education, it is especially important that you also gain experience working with people from diverse backgrounds. Taking a class such as intercultural communication or studying abroad are great opportunities to show your openness to working with people from diverse backgrounds and you have some experience working with cultures other than your own. Another great place to gain experience working with people with diverse backgrounds is to get involved in your campus’s Multicultural Center or in the community. Many communication majors will go into the field with the hopes to go into the field of law. One downside to choosing to go into this field with your communication degree is that you will most likely have to go to law school and take entrance exams such as the Law School Admission Test. If you don’t want to do these things, law might not be the path for you. The plus side is that there are several different jobs that you can get with a law degree other than being a lawyer in a court room. For instance you could work for a non-profit or public interest group or as a mediator in various settings. Different employers include law firms, universities or colleges, or legal clinics also look to hire lawyers. Some tips for getting into law with your communication degree is to choose a minor based on what type of law you would like to go into. For instance if you want to go into corporate law, a business minor might be a good choice. If you want to spend more time in the courtroom, it would be a great idea to get involved in a debate team to gain some experience. Finally, as with any major, it would be a great idea to try to shadow someone in the field to make sure that this is the direction you would like to go. One area that also loves people with a strong communication background is the non-profit field. The types of positions you might be hired for are management, writing or editing, public relations, and the list goes on and on! To get a position in one of these positions some background in psychology or sociology is always a great idea. Again getting involved in the community is a huge plus when trying to land a job at one of these positions. Chairing a committee or taking on some sort of leadership position are great since a lot of positions (not all) that are available are management-type positions. When looking at working for a non-profit organization it is very important that you do your research and make sure that your values and beliefs align with the values and beliefs of the non-profit. If you know that you want to work for a certain non-profit organization, doing some volunteer work with that non-profit can give you a foot in the door to explaining how you know that your values align with their values and why you want to work for them! If you don’t know what area of communication you want to go into, it can be hard to know what you can do to prepare for your future job. It’s the double-edged sword of the communication major. You can do so much, and yet, nothing is really clearly defined for you. Developing transferable skills and getting involved on or off campus are critical steps to helping you choose that path in communication you want to take. Exploring your options is also a critical part of knowing where you want to go with your major. By exploring your major you can see what you would be interested in and what you don’t ever want to do. The possibilities in the world of communication are endless! What are recent UMD grads in Communication doing?